Chris Lucas is the founder and CEO of Ompractice. He is the former digital director for Baptiste Yoga and a certified teacher since 2012. In addition to years of training with Baron, Chris has studied under Brandon Compagnone, Natasha Rizopoulos, and Ross Rayburn among others. His classes are known to be fun, challenging, and leave you ready and recalibrated for whatever comes next. 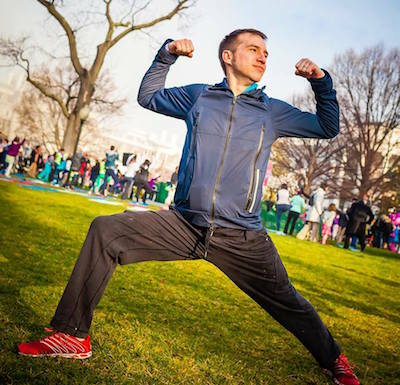 He taught yoga at the White House Easter Egg Roll for six years during the Obama Administration, and is a board member of Yoga Reaches Out, a ‘yogathon’-based charity that has raised over $1,000,000 for organizations focused on helping children and their families. Chris is also the producer and editor of the Ashtanga Dispatch Podcast. He lives in Northampton, MA with his wife, daughter, and dog. "I've missed Chris' classes after moving away, and I'm so glad to be able to take them again!" "Chris injects humor in just the right places, while keeping me focused and present to the process."